Brush Wizard: Wander: Tank all Finished! While at GenCon I worked the Ninja Division booth with Elizabeth Beckley-Bradford, who's husband Jonathan is one half of Panda Cult Games. Panda Cult Games are an ultra small indie game studio and they are currently in development of their first game, Wander: The Cult of Barnacle Bay. In the lead up to GenCon, Liz got me super hyped on the game, and I made it a point to run over to their booth to pick up the current metal figures, which were original Kickstarted in 2016 under Heath Foley's company, Red Panda Miniatures. Well I am home now and in the process of painting up all of these wonderful animal people. I knew right away that I would start with Tank, a one-armed turtle brandishing a shield. I think he called to me the most, because he's a turtle and I always play defensive characters in my RPGs. 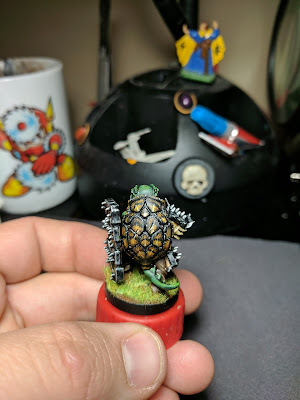 I painted up Tank with it in mind that I would try my hand at giving him a tortoise shell pattern. My friend Drew showed me a picture of one while we were at GenCon and I was instantly in love with the look of it. 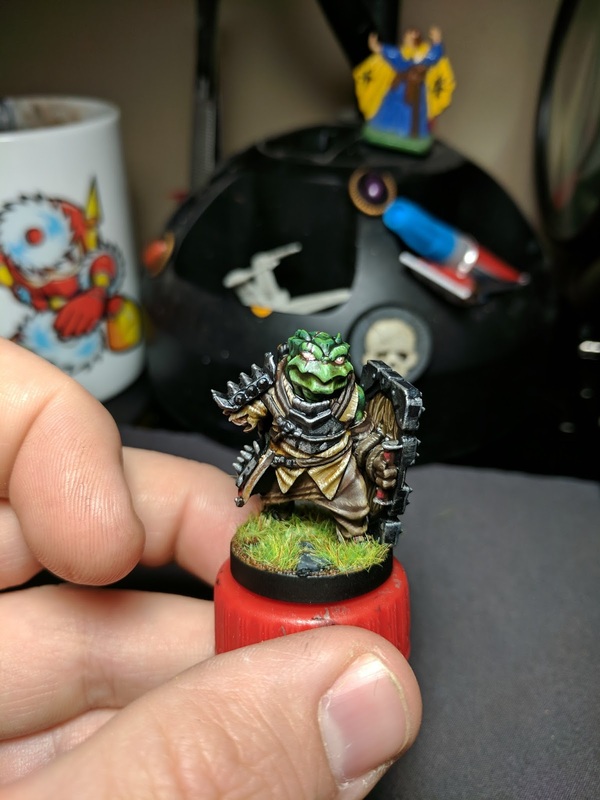 But before I went to work on that, I painted the rest of him first. with a mix of Caliban Green and Warboss Green. I then worked up highlights by adding Yriel Yellow to the mix and finally some Flash Gitz Yellow. I originally painted his face with the same mixes of color, but realized that I needed it to be lighter, so I painted his face and neck with the highlight color and then worked in white to highlight it more. All of the leather was painted with Rhinox Hide and my standard recipe for doing leather. Which is usually Rhinox Hide, a wash of Agrax Earthshade, then highlighting with Chocolate Brown, Flat Earth and Ushbati Bone. After the leather was finished, I added some glazes of Druchii Violet to the recesses of the pant to help shade them and give them a bit more depth. The tunic was painted with Rakath Flesh, a wash of Seraphim Sepia, then more Rakarth Flesh and some Ushbati Bone highlighting. give him a bit more character. With that in mind, I added a couple cut marks to his face. But then I realized that if he was cut over his eye there would be a good chance that his eye would be damaged. It was an interesting challenge trying to paint a blinded eye, and I would not suggest doing internet searches on the subject... its kind of disgusting. After painting up the scars on his face, I couldn't help but think something was off. That's when it hit me that he needed a scar on the top of his head to line up with the one on his eyebrow. I wish I could remember the mixes and colors I used for the interior wood of the shield. It looks so good and I can't recreate it to save my life. I got close while doing the exterior, but its not a 100% match. Maybe one day I'll be able to unlock that mystery. The last step before painting the shell was to paint all the metals. This was done using my usual High Contrast Metallic technique, but with a few new steps. This time, once it was all painted, I added a glaze of Drakenhof Nightshade, this was then followed by a rehighlight of Ironbreaker and a new edge highlight of Stormhost Silver. I think it turned out even better than before and I may have to edit/rework my tutorial on the matter. The blue of the Drakenhof Nightshade added in some much needed visual interest into the metal and helped darken the black sections more, before the dullcote step. 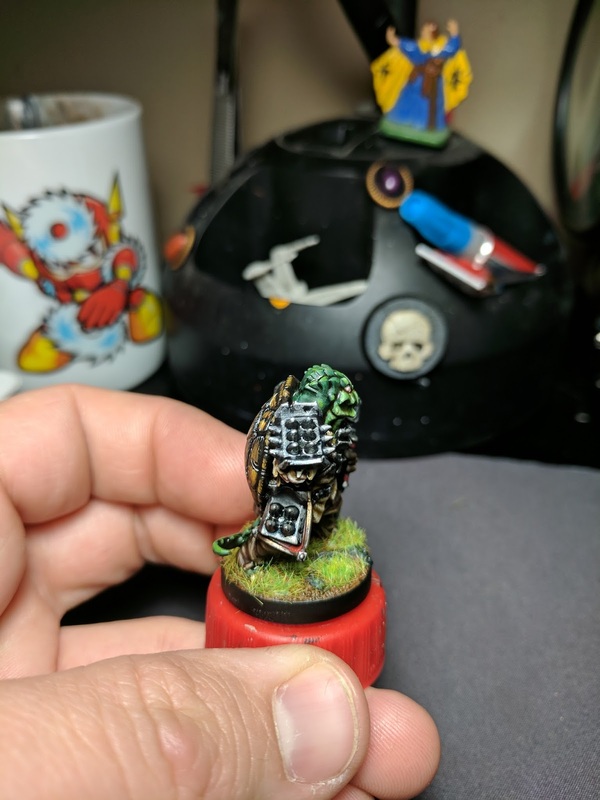 Finally it was time to paint the shell. I started by touching up the black primer and then used a very thin layer of XV-88 as the base coat. From there, it was a whirlwind of custom mixes and glazes invloving XV-88, Troll Slayer Orange and Yriel Yellow for the sunbursts. The dark sections were mixes of Rhinox Hide and Black. 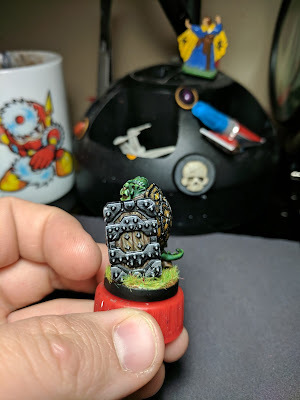 When the shell was finished, I touched up the recesses with black and then started glazing the shell with Agrax Earthshade. I started the glazing at about 3/4 up the shell and then worked my way down to the bottom with less coverage with each new layer. Once the Agrax was done, I added some Nuln Oil on top or the bottom 1/3 and did a few coats to darken it up on the lower bits. That's pretty much it! Tank is all finished and I have since moved on to Jon the chameleon bard (which I also just wrote about). Be sure to check my Twitter and Instagram for up to date progress and keep an eye out for Panda Cult Games' Wander: The Cult of Barnacle Bay, coming to Kickstarter in September!